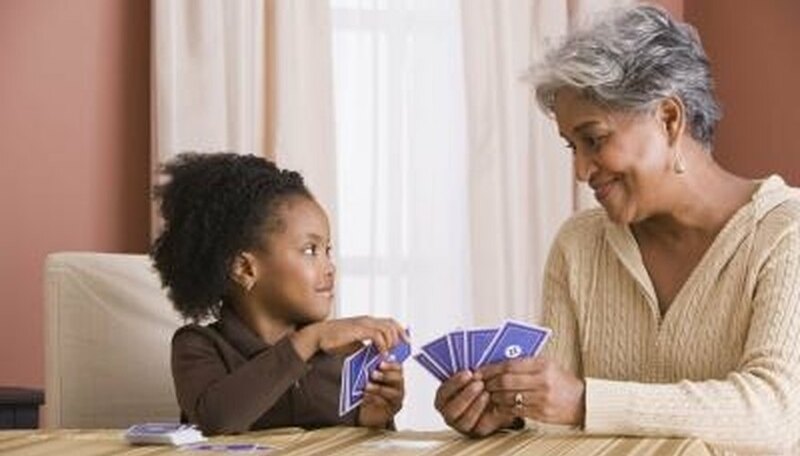 Big Fish Lil' Fish is a card game for two to six players recommended for children 6 and older. The game consists of 60 cards including 48 numbered Fish cards and 12 Puffer Fish cards divided evenly among four colors. Players try to be the first to discard all their cards into the Pond. Choose a player to deal out the entire deck of cards among players. Some players can have one more card than others. The first play is made by the dealer, who places any card from his hand face-up in the middle of the table to start a discard pile, called the Pond. Players race to play cards to the Pond following four general rules. A player can play a bigger Fish, or a higher-numbered card, than the top one on the Pond. The Fish played must be a different color than the top one. A Puffer Fish of the same color as the top Fish on the Pond can be played. When a Puffer Fish is played, the game is halted until the player who discarded it plays a Fish of any color or number or another Puffer Fish. Players continue to lay down their cards as quickly as possible until someone breaks a rule. If a player breaks one of the four rules, tries to pick up a card after it has touched the Pond, does not lay a card directly on the Pond, throws a card into the Pond instead of laying it down or lays down more than one card at a time, play stops and the player must pick up all of the cards in the Pond. She then lays down a Fish to start a new Pond. If at any point during the game the Pond becomes frozen-meaning none of the players have a card to play-the dealer must shuffle only the cards in the Pond, deal them to players, and start a new Pond for play to continue. The player who successfully gets rid of all of his cards is the winner of Big Fish Lil' Fish.